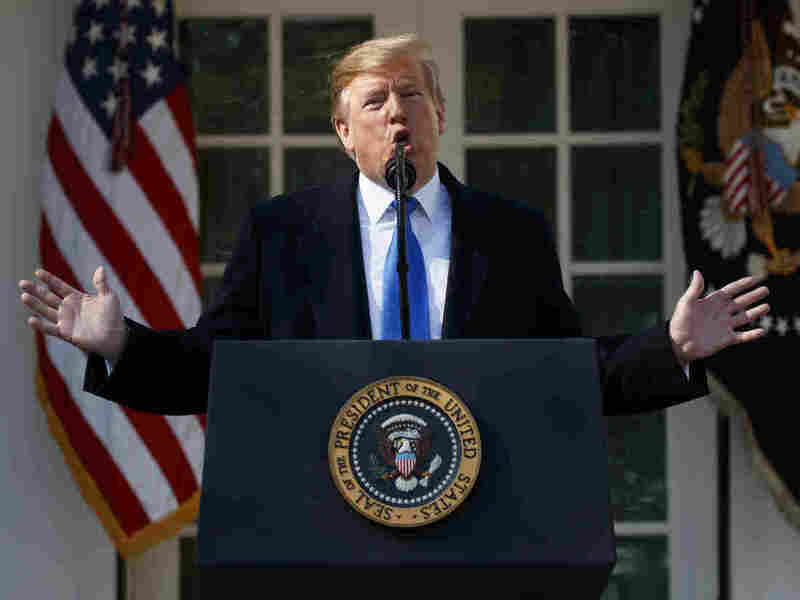 President Trump speaks in the Rose Garden at the White House on Friday to declare a national emergency in order to build a wall along the southern border. If Congress votes to disapprove Trump’s declaration of a national emergency, the president is prepared to veto it, White House senior adviser Stephen Miller said on Sunday. The president is declaring a national emergency to secure up to $8 billion in funding for a barrier on the southern border — more than four times what Congress approved. House Democrats have called Trump’s declaration unlawful, and are considering a joint resolution disapproving of the declaration. Miller’s comments during a Fox News interview made it clear the president is unlikely to back down. “If they pass a resolution of disapproval, will the president veto that, which would be the first veto of his presidency?” Fox News host Chris Wallace asked. “Well obviously the president is going to protect his national emergency declaration,” Miller responded. “So yes, he will veto?” Wallace pressed. A resolution of disapproval would let Congress overturn Trump’s declaration and would likely pass in the Democratically controlled House of Representatives. But it would face uncertainty in the Senate, where multiple Republican lawmakers would have to join with Democrats in the minority. Illinois Sen. Tammy Duckworth told ABC’s This Week that she believes the Senate has enough votes for such a resolution. If Trump vetoes the resolution, Congress would need a two-thirds majority in both houses to override — unlikely, given the current political makeup of the chambers. If Congress were unable to override a Trump veto, Duckworth said the House should sue based on the argument that only Congress has the power to appropriate funds. Trump is already facing several legal challenges, including one promised by California Attorney General Xavier Becerra arguing that the state will be harmed when Trump diverts funds for a wall. Presidents have invoked emergency powers for decades, but this is the first time one has used an emergency to secure funding for a project that Congress has explicitly declined to fund, The New York Times reports.